Manage diversity as a strategic business objective and understand how a high performing diverse workforce can be built on the basis of mutual acceptance and trust. I have a learning goal to acquire an understanding of the way of managing diversity as a strategic business objective and understand how a high performing diverse workforce can be built on the basis of mutual acceptance and trust. In relation to this learning goals, presently I am well aware and understand the need and importance of managing workplace diversity to build a talented, motivated and diverse workforce. However, I lack the systematic way of designing and implementing a comprehensive diversity management strategy which can be linked to organizational plans. I would like to learn about various strategies that can be implemented for supporting individual office diversity management as well as for contributing towards the progress in achievement of organization wide diversity management goals. These requirements will guide the literature review presented in next section where a focus will be on strategies to approach the goal of diversity management. Organizations stress on many convergence issues which facilitate to ensure achieving collective goals, objectives and results, requiring people to come together to pursue common goals despite their diversified entities. With globalization, workforce diversity is now a natural phenomenon in every organization, whether they operate in the national market or internationally (Bhattarcharya, 2008). Even within a nation, we find such diversity in terms of religion, language, etc. Without diversity, organizations become ineffective and stagnant, and will only try to perpetuate the age-old culture legacy, without bothering the need to change (ibid.). Thus, diversity in organizations should not be viewed as a problem; rather, it should be managed properly to gain advantages. Cultural diversity promotes new ideas, makes organizations innovative, and strengthens the organization’s competitive strengths the organization’s competitive strength. Like organizational effectiveness, diversity has become a popular word that can mean many things to many people. It is often a word loaded with assumptions and received or identified with strong emotions. Diversity can be understood in the context of organizational effectiveness as: diversity is defined as the ways in which people differ and how these differences enable, enhance or inhibit the abilities of individuals, groups and organizations for achieving individuals, collective and or organizational goals and objectives (Davidson, 2011). Establishing a clear definition of diversity and organizational effectiveness will assist an organization and all those involved in more effective development of the diversity measurement strategy (Bhattarcharya, 2008). When it comes to metrics, the definition matters greatly as it will determine perceptions, strategy and what is valued in metrics and where emphasis will be placed. In order to manage diversity in an efficient manner there is a need to follow a model for strategic measurement of diversity allowing a broad range of approaches and flexibility and helping the organization in establishing a strategic focus with practical application (Debrah and Smith, 2007). Creating diversity: Creating diversity is about creating a balanced workforce. This means understanding inclusion and exclusion and what people- individuals, groups or segments of the workforce might be excluded form contribution, opportunity and fair and equal treatment (Debrah and Smith, 2007). It is about how their presence or lack of presence enhances or inhibits organizational effectiveness. It is about how an internal workforce reflects or does not reflect the local or national population (ibid.). The metrics most often associated with the creating quadrant of the model are typically those based upon representation by race and gender. Although visible differences are a key element to creating diversity, visible diversity is a minimal objective (Jackson, 2006). Parity, balance and inclusion based upon a wide array of factors are important (ibid.). Managing diversity: Managing diversity relates to all those factors that come into play in how people are managed, developed, evaluated and included or excluded from teams, or individual contributions to the business (Jakcson, 2006). The most common metrics utilized for the managing diversity quadrant include promotions, equity in performance reviews and compensation analysis (ibid.). Valuing diversity: Valuing diversity is more nebulous term, and relates to the internalization of a value inherent in the culture of the organization. The work environment is a critical metric in the quadrant and can provide a barometer for the value of inclusion and diversity. Valuing diversity is sometime driven and benchmarked by a formal organizational values statement, but will also likely manifest itself in a visibly diverse top management team as well as throughout the organization (Raffel and Leinsink, 2010). Valuing diversity can be seen in a variety of indicators. Leveraging diversity: Leveraging diversity is associated with the synergy of differences and the positive results or benefits of creating systems and processes that draw upon the belief and power that diverse teams, views and opinions can result in better problem-solving, greater innovation, better customer service and ultimately in improved bottom-line results and profitability (Raffle and Leinsink, 2010). It relates to those things that build upon diverse people, perspectives and teams to create more innovation and creativity and that the presence of diverse individuals improves decision making and the customer-company link (Davidson, 2011). On the other side of leveraging diversity is the failure to do so, resulting in lost opportunity. Although difficult to measure, ‘lost opportunity’ can be a powerful perspective when considering metrics (ibid.). Each of the four segments- creating, managing, valuing and leveraging are interrelated and inextricably intertwined. Although there may be programme specific or tactical metrics that may seem totally independent of other metrics, it should become clear how sets of tactical measures all come together to create a comprehensive strategy (Davidson, 2011). Although the focus or emphasis may vary from quadrant to quadrant at different points of time, it is again critical to ensure that tactical metrics indeed exist for each of the four categories to ensure the completion of the strategy (ibid.). Moreover, there are multiple types of metrics that apply to each the quadrants to complete the strategic model. In the present day globalized environment, one of the key challenges faced by corporate leaders and human resource managers is the one related with management of a workforce that has become increasingly diverse in nature. The diversity of workforce is not a transient phenomenon but a key element of our heterogeneous societies. However, this heterogeneity of the society is not responsible for the issues associated with management of a diverse workforce but it is the inability of corporate managers to comprehend the dynamics of such a workforce in full and divest themselves of their personal prejudicial attitudes and creativity to unleash the potential of a workforce that is multicultural in nature (Hubbard and Hubbard, 2010). There is a need for managers to consider diversity management as a strategic issue and handle it a manner that a high performing workforce is developed and maintained for the benefit of the organization (Raffle and Leinsink, 2010). The phenomenon of diversity is associated with outcomes at three basic levels including individuals, group and the organization as a whole. Therefore, the strategies to manage diversity are also studies and practices in relation to these three levels. The impact of workplace diversity is experienced by the organization through an indirect effect brought at the individual level (Rynes and Rosen, 1995). The most important and most popular individual-level intervention is the diversity training that helps in changing individuals. The review conducted by Ford and Fisher (1996) considered training programs as a tool to change attitudes and behaviours of employees for valuing diversity and reducing subtle forms of discrimination and exclusion hindering the effective work relations. Three major types of training objectives have been noted by Ford and Fischer (1996) where the first is programs to foster assimilation providing education related with goals and norms of the dominant culture, secondly the programs to focus on emphasising the adjustment and accommodation of the majority to the changing workforce and thirdly programs emphasizing on multiculturalism involving a process that is bilateral in nature focusing on majorities as well as minorities. Nkomo and Kossek (2000) provided information about the basic training topics including stereotyping, prejudice, communication styles and attitudes. Lobel (1999) also reviewed the major diversity initiatives and considered training on attitudes as the most important initiative having a positive impact on management of diversity. There is a need to focus on diversity management within groups with a special consideration for potential conflicts among members of diverse groups. Identity-based networking groups are considered as a major HR intervention that can prove to be useful in case of managing group level diversity (Rynes and Rosen, 1995). It has been argued by Friedman (1999) that identity based groups are a source of opportunity for members to connect in a social and professional manner resulting in expansion of the range, strength and configuration of their social networks. There is a need of addressing a change in the culture of the organization so as to ensure creation of work environment where teamwork is nurtures, participation and cohesiveness is encouraged and a collective form of organizational culture is fostered (Dwyer, Richard and Chadwick, 2001). In order to achieve this objective there is a requirement of strategically integrating the objectives of the business organisation with the diversity management programs. It is the responsibility of top management to model leadership behaviours through organising the sessions where feedback is encouraged about the results of an organizational diversity climate. The involvement of top management is necessary for the success of any diversity management initiative targeted at the organization as a whole. Here it is to be noted that it is not sufficient to implement a diversity management program at any level, as there is a need to have a formal measurement system in place at the early stage of the implementation process (Jackson, 2006). Such a regular evaluation and monitoring program is necessary to ensure success of diversity management initiatives and keep a regular check to make modifications and changes wherever the need arise (Nkomo and Kossek, 2000). Such a step will require collection of a large amount of data for assessing the dominant culture of the organization and the perception of various groups of employees across the organization. Leadership has been regarded as an important diversity skill through influences such as recommending, supporting, and mentoring others in determining policies, encouraging acceptance of difference and providing examples of behaviour in commitment, communication, decision making and conflict management. However, more recently the leadership role in diversity management has expanded to include a strategic perspective based on productivity and/or best practice justification (Hubbard and Hubbard, 2010). As the leadership and diversity management nexus changes, more work needs to be done in order to expand the current understanding of the role of leadership in diversity management (Raffel and Leinsink, 2010). Diversity is currently conceptualized as interpersonal and intergroup interaction, combined with the practice oriented work on human resources and employment (ibid.). Hence the leadership and diversity linkage has been a practical one. There is an existence of a strong link between diversity and leadership. Leadership is associated with empowerment of individuals and bringing out the best in them. This objective of achieved by making people feel accepted, respected and connected (Debrah and Smith, 2007). If individuals feel confident about themselves and their company, they can be expected to gives best of their potential for the achievement of organizational goals (Debrah and Smith, 2007). These objectives and goals of leadership are same as the objectives of diversity management strategy. Therefore, it is possible for leaders to integrate the diversity initiatives with their leadership models for promoting and developing leadership skills of leading and directed a diverse workforce. This particular model comprise of acceptance for the differences among people and integration of their ideas, training the staff members with respect and dignity, and promotion of collaboration and cohesiveness among people to build effective work relations. Such a way of leadership used for fostering and maintenance of diversity helps leaders to weave diversity into the culture of the organization. 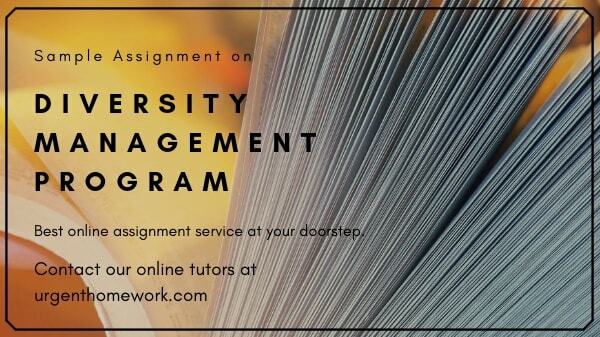 Organization have focused on several aspects of managing diversity in present day global environment. Some organizations have focused on responding to legal obligations, while some have formulated policies and programs and several others are relying on implementation of broad diversity strategies related with management of diversity under a HR perspective. Therefore, diversity management is not limited to the work responsibilities if HR department, but extends to all levels and need the involvement of top management as the basic necessity ensuring the success of any programs and strategies associated with management of a diverse workforce. Furthermore, diversity is required to be managed at individual, group as well as organizational level as a whole. Thus, there is a need of following an integrated approach towards diversity management where all levels and all employees across the organization are involved and affected through strategies of improving collaboration and communication among team and group members. However, the literature review suggests that there are several different strategies followed by organizations and no perfect strategy for diversity management is suitable for every organization. There is a need have knowledge of some of the best practices in diversity management to achieve high performing teams and customizing these best practices as per the needs of the concerned organization. These studies and understanding about the strategies of managing diversity in order to attain collaboration and cohesiveness among staff members coming from various different background will guide the real time process to be followed for acquiring a learning in this particular field. The methodology to be used for gaining an understanding of diversity management to achieve high performing diverse team will be discussed in the following section. In order to achieve the learning goals of managing diversity as a strategic business objective and understand how a high performing diverse workforce can be built on the basis of mutual acceptance and trust, there is a need to follow some specific strategies. These strategies will help me in attaining objectives and sub-objectives associated with this leadership goal before getting a clear understanding about the ways that should be used to management diversity in an efficient manner. The first strategy to achieve the goal of learning about diversity management strategies of achieving high performing teams is to gain a knowledge about some of the best practices related with the issue as implemented successfully in most of the organizations. In order to study these best practices the focus of my study will be on collecting information about various different ways in which diversity can be linked to strategic plans so as to make diversity a powerful tool to achieve a competitive advantage for the organization. The information will be collected through companies’ best practices, through articles on successful linking of diversity and strategic plans and through study of research articles on the subject. The information about the role of leadership and the need of taking ownership and communication of vision will also be collected and studied through these sources and strategy. Further, the knowledge about the need and role of employee involvement will be studied to achieve teams having mutual trust and acceptance. Here there will be a need of direct conversations and discussions with HR managers of some selected organizations to get the real time view about issues involved in employee mentoring and employee wellness and the way forward to make people recognize the need of connecting with their team members through trust and acceptance. Therefore, the strategy of interviewing or getting into informal conversation with HR managers will be followed to achieve the learning goal. Another major strategy to be followed for achieving the learning goal will be to collect the latest media reports of stories and case studies related with linking diversity with business strategy and implementing programs to manage diversity in a manner that results in high performing teams. These media reports available from newspapers, business magazines, and internet sources will be studies and analysed to identify the steps and strategies that various organizations have followed to make efficient use of diversity at the workplace and also the hurdles and problems that were faced by them while making such an effort. The analysis will also be conducted to find out the solutions of various possible issues that may arise while implementing diversity management initiatives.